Kids love the little dry erase lap boards, but I don't. The markers stink, they invariably run out of ink or squeak right when even the wiggliest kids are on task. Kindergartners draw on their clothes, skin, the carpet, or worst of all- the one child whose parent sends their child to school in Sunday best. Work gets wiped off, or they run out of room, and just when a child has done AMAZING work it is erased. And the hassle of storing and passing out the markers Nd erasers and boards too- what a pain. Sketchio has solved all of those issues for me. Sketchio is the go to app for basic white board use; it allows color options, but limited choices over all. I love the limited choices! My students know to pick one color at the beginning and stick with it. It also allows for getting a blank page while keeping the previous work. Doodle buddy is another great option too. It has LOTS of choices in color, writing tools, text, special effects, etc. Too many really, to replace the simple whiteboard, but perfect for creative expression, what I like to call Digital Ink. 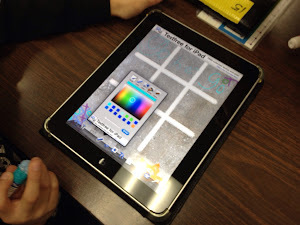 My students make homepage and lock screen pictures using Doodlebuddy. 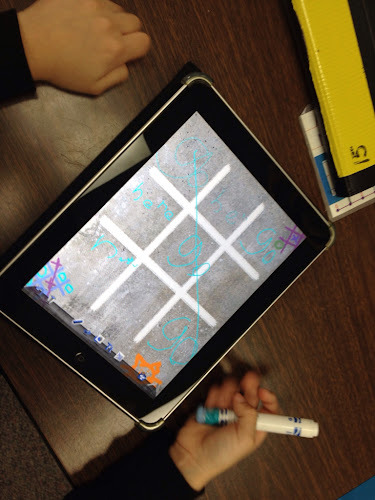 Today I used its' tic-tac-toe backdrop to have kids practice writing sight words and letters we are working on. I like to have them use my homemade stylus for writing on the iPads. Wow! How did you make your homemade stylus? What do you make your homemade stylus out of? I understand that some of the ones available to purchase can scratch the iPad surface. Is that one of the reasons that you have decided to make your own? In October 2011 I shared on this blog how to make it (conductive wire, sponge, crayola marker casings and duct tape). I wasn't worried as much about scratching as I was the price, appropriateness for little fingers and durability. I bought a Pogo stylus for me for $15 and my three year old ruined the tip in one use.